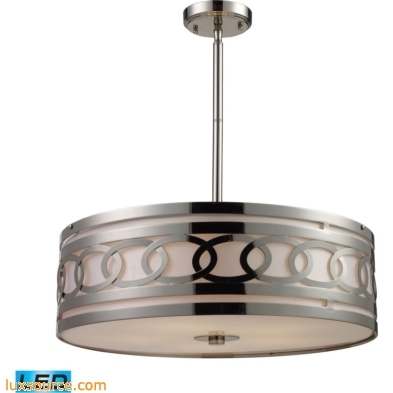 The Zarah pendant offers modern design elements coupled with high quality craftsmanship. A fabric drum shade provides the backdrop for a polished nickel finished frame and laser cut ovals literally link together like a chain, this pendant combines cutting edge style and jewelry-like appeal. A frosted white glass diffuser emits a soft yet functional light. Finish Detail: Polished Nickel. Material: Metal,Glass,Fabric. Includes easily replaceable 9.5 watt dimmable, medium base, screw-in LED bulbs with 4000 lumen total output.